Looking at the expanse of the Black chess world, there apparently exists the desire to sharpen one's game on those friends who are considered to be worthy opponents. "Steel sharpens steel," the saying goes. In the early to mid 80s, Chicago had a raging debate on whether the brothers on the south side were stronger than those on the north side. The north siders were the gambling blitz demons, while the south siders were a strong lot of former scholastic stars. Of course, everyone knew that NM Marvin Dandridge, the ultra-sharp tactician, was "king of the hill" on either side! That is. . . until another south sider, FM Morris Giles came out of retirement! I (Daaim Shabazz, south sider) had received a phone call one evening from Tyrone Lee who spoke of having a tournament to discover who, among the dozen or more Black "Candidate Masters," was the strongest. Being the confident junior that I was, I almost suggested that I could give him an answer without a tournament! For a number of reasons, the tournament never took place. 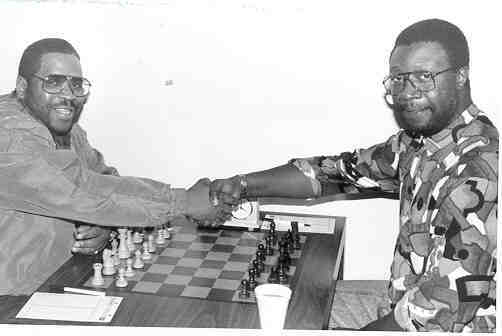 There had been Chicago chess clubs run by Black players in mid 80s: Eric Johnson's Chicago Chess and Gammon in Hyde Park and Pawn to King Four on North Halsted. For many years, a loose network of Chicago players would get together and engage in fierce battles. . . mostly for stakes. FM Emory Tate, an Indiana native, would often visit for these spirited battles. Billy Turner of Ohio has also made the trek to "lock horns." Chicago native John Porter has sought to formalize the "Brotherhood Fraternity of Chess," (or BFOC) and establish a network stretching across the country. 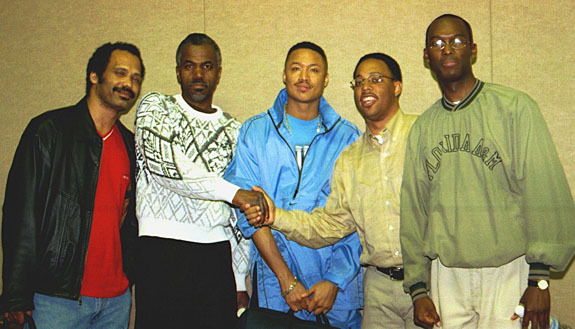 (L-R) FM Emory Tate, Sam Ford, Billy Turner, Frank Johnson, and Daaim Shabazz at 2001 National Open in Las Vegas. In New York, FM (now GM) Maurice Ashley launched a powerful idea which began with a letter dated, 8 February 1992. It was a call for a tournament comprised of the top Black players in the U.S., ". . . to educate, uplift, and unify the strongest players of African descent in the U.S." Maurice's letter expressed a concern about the fragmentation in the African-American chess community. The concept was, "Together we stand - divided we get mated!" The first of the four Unity Chess Tournaments took place in New York on 22 February 1992 and included a number of strong Masters including: FM Ashley, FM Ron Simpson, NM Mark Meeres (now deceased), and NM Jerald Times. In the three that followed, other Masters and Experts partipated. Some were: NM Wilbert Paige (now deceased), NM Ernest Colding, NM Norman Rogers, NM Elvin Wilson, Willie "Pop" Johnson, David Diamond, Nathan Jackson (later made Master), Vincent Munro, and Jeffrey Mitchell. In addition to these historic tournaments, the competitive atmosphere persisted with several New York-Philly interstate battles. By now, you may have heard of the Wilbert Paige Memorial tournament. This tournament is certainly historic, but has a forerunner. 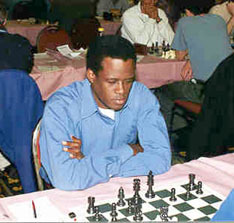 In 1993, Jones Murphy (a Candidate Master) conceived an idea of holding tournaments in which Black Masters can compete for norms. The Murphy - ACF International was the name of the tournament designed to harness the collective talents of players of African descent. After a dedicated effort, funding was secured, arrangements were made and the first of two Murphy - ACF International tournaments was held in March 1994. Participants in this historic event were: IM Maurice Ashley, NM Norman Rogers, NM George O. Umezinwa, and NM Deon Solomons of South Africa. 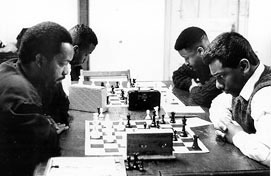 Willie "Pops" Johnson vs. FM Ron Simpson (front) & Jeffrey Mitchell vs. FM Maurice Ashley (back); 2nd African-American Unity tournament, 1992. NM Norman "Pete" Rogers vs. NM George O. Umezinwa; First Murphy APC International tournament, 1994.